France’s most notorious criminal Jacques Mesrine has been attributed to countless murders, bank robberies, kidnappings, and prison breaks, for which he became a media icon. Despite his record, the public was fascinated with him, not unlike John Dillinger or Bonnie and Clyde, as the glamour and danger of criminal life has always had its romantic appeal to the public. During his time in Paris’ La Santé prison in the 1970s, Mesrine wrote an autobiography, L’instinct de mort, detailing his exploits; the book was smuggled out of prison and published. 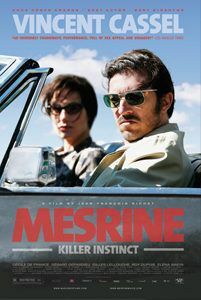 Filmmaker Jean-Francois Richet and co-writer Abdel Raouf Dafri have adapted the book into the most impressive crime epic since Michael Mann’s Heat, called Mesrine: Killer Instinct. 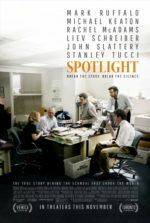 Released in 2008 in France, the film, distributed by Music Box, receives similar distribution to their U.S. release of The Millennium Trilogy, which has taken its sweet time to arrive in theaters. Richet broke the screenplay into two full-length features, Killer Instinct and Public Enemy No. 1, which are two halves to a greater whole released about a month apart from each other. Written as a single piece, they were intended to be a single film that would have run more than four hours. Although it’s understandable to break up the picture into two parts, given the picture’s fast-paced style, the time would have flown by had it remained intact. As is, the breezy two-hour Killer Instinct makes an intriguing first half, even if the experience feels understandably incomplete when “End of Part One” appears at the end. Epitomizing the title anti-hero, Vincent Cassel portrays Jacques Mesrine in a performance that has already won him much acclaim, including the Best Actor statue at France’s César Awards (their equivalent to the Oscars). Cassel is no stranger to complicated, violent, and often disturbing roles. His breakout performance in La haine in 1995 gave way to an appearance in the unsettling Irreversible, a laser-light dancing thief in Ocean’s Twelve, and his multi-layered presence in David Cronenberg’s Eastern Promises. 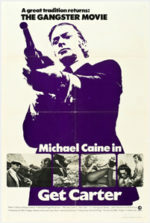 His powerhouse portrayal as Jacques Mesrine involved gaining forty pounds and shooting the film in reverse chronology, so as Richet captured the actor’s scenes, Cassel was allowed to drop weight for scenes of the younger Mesrine. The actor’s appearance, both devilish and charming, perfectly captures the danger of a charismatic criminal. Richet’s first film begins in the 1950s with Mesrine in the French army during the Algerian War, and overviews the next 15 years in patchy detail, covering the man’s most momentous exploits with as much specificity as a two-hour biopic on an entire life as busy as Mesrine’s can offer. When he returns to Paris after the war, Mesrine teams with an old friend, Paul (Gilles Lellouche), who introduces him to a crime boss, Guido (Gerard Depardieu). They conduct robberies and the occasional murder. Mesrine marries a Spanish girl, Sofia (Elena Anaya), after getting her pregnant; she leaves him when she realizes that he will not abandon his hoodlum buddies for her. And after gathering too much attention in France, Mesrine flees to Quebec and establishes a lasting Bonnie and Clyde-esque relationship with Jeanne Schneider (Cecile De France), as well as a professional partnership with Canadian criminal Jean-Paul Mercier (Roy Dupuis). They’re all eventually caught and wind up in prison. Mesrine and Mercier serve time at Saint-Vincent-de-Paul maximum security prison, the centerpiece of the film’s impressive finale, based around Mesrine’s brutalizing time in prison and his subsequent escape. And despite some terrifying scenes with Sofia—including one where he places the barrel of a gun in her mouth, giving her an equivalent to the “don’t ask me about my business” speech from The Godfather—the filmmakers are successful at keeping their representation of him curiously sympathetic. Shot with the violent-but-truthful sensibility of Martin Scorsese’s Goodfellas, Richet’s production sweeps through the highlights of Mesrine’s early life, rendering the characterization through legendary criminal myth-making versus an affecting humanization. Audiences may only gather a sense of the character and what drives him, however, as the film would rather just tell Mesrine’s incredible story than try to understand what motivates his every crime. Through Cassel’s performance and Richet’s hints that Mesrine’s life was a series of sometimes random, unmotivated crimes, the story proves undeniably absorbing despite the lack of critical insight. The production feels inspired by modern classics of the American crime genre—films by the aforementioned Coppola, Mann, and Scorsese—and Richet’s direction fits with their work nicely. Having directed little worth mentioning prior to these films, save for the lackluster remake of John Carpenter’s Assault on Precinct 13, Richet’s occasionally masterful execution of particular sequences and the film’s clever editing come as surprises, albeit pleasant ones. Still, seeing Killer Instinct and having to possibly wait weeks to see Public Enemy No. 1 leaves the viewer feeling the story is incomplete on its own, and may lessen the effect. Killer Instinct remains only half of a film, and audiences are strongly encouraged to see the two parts back-to-back if possible, or if necessary on home video in one long sitting.